Your spouse has chosen a beautiful gown for your wedding day. Now you're left to find a tuxedo. You probably have no idea where to begin. That is okay. This guide was created to give you the tips necessary on finding a tuxedo. You have to determine whether to rent or to buy, the type of tuxedo you want, and how to wear it correctly. Proper fit is KEY when picking a tuxedo. You should have full range of motion in while wearing your jacket. Lift your arms up move your arms and shoulders around. If it feels tight in anyway then it is too small. The sleeves on your jacket should gracefully fall to the middle of the top of your hand. When you lift your arms, your jacket should not come above your wrist. Your pants should not be tight , they should fall right to the mid line of your shoes. 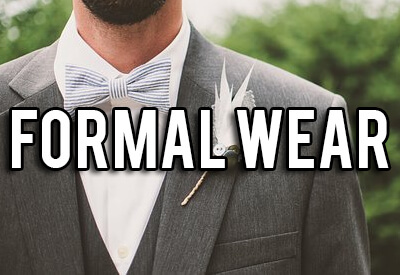 A good formal wear store will help you find the best fit. If you have grooms men, have them be measured by a tailor and send you the proper measurements. Find something that complements your body shape, again a good formal wear shop will advise you on what type of suit will best fit your body. Make sure they have the suit stemmed and pressed before you pick it up. Being well groomed is essential in looking good in your suit. Take a shower. Shave, get rid of your uni-brow. Clean under you nails, clip them as well. Use nice cologne. Go visit a barber and get your hair cut. The tuxedo is only half of it, not being well groomed can make the best tux look like a disaster. Have your grooms men do the same as well. It's a good idea to have your spouse play a role in helping you decide on tuxedos for you and your grooms men. Your tie and accessories should never over power your spouse. You may want to rent or purchase your suit. Here are a few tips. Renting a suit cost about 10 to 30 present the price of an new suit. If you rarely attend formal occasions you should probably rent a suit. If you attend three or more formal occasions per year your best bet would be to purchase a new suit. You will save thousands of dollars over the years. All though choosing a tuxedo and formal wear shop can be difficult, if you follow these steps it should become an easy task. Lucky for you Atlanta has various creditable formal wear shops for you to choose from. Go check them out!